Passenger numbers in Scotland have doubled in the last two decades reaching 96 million in 2015 with the result that the network made up of 1,770 track miles, 4,331 bridges and 90 tunnels is struggling to cope with demand for more and longer trains. The greatest impact is being felt in the largest travel markets of Glasgow and Edinburgh where the past closure of two (Buchanan Street and St Enoch) out of four terminal stations in Glasgow and one (Princess Street) out of two in Edinburgh has created a significant capacity constraint. Of those that remain Glasgow Queen Street is currently being rebuilt as part of the Edinburgh Glasgow Improvement Programme. At Edinburgh Waverley the long term plan is to provide an upper deck for a new concourse with passenger facilities and retail outlets which will allow three new through platforms to be installed at track level together with work to extend bay platforms. 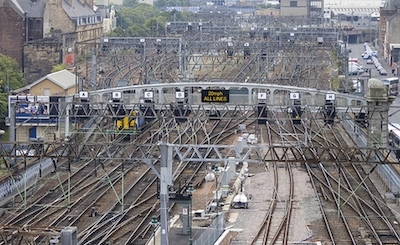 The projects are outlined in Network Rail’s latest long term route plan for Scotland which provides expected demand forecasts from train operators for track access up to 2043 which has a range of scenarios reflecting UK economic projections with typical compound rail growth of 2% annually. A significant input covers the provision of through Anglo-Scottish services after HS2 opens in 2026. Trains will run on the high speed line before joining conventional West Coast infrastructure. It is intended to operate the 400 metre long trains in two portions for Glasgow and Edinburgh with the trains being divided at Carstairs which will be remodelled to cater for this. The operation of single destination trains is seen to be impractical given the layout of the terminal stations. The easterly approach to Edinburgh Waverley station is constrained by a growing number of East Coast main line and local services that include trains from North Berwick and the recently opened 35-mile Borders Railway from Tweedbank. A four track section of line is proposed from Drem with increased platform faces at local stations and one of the single bore Calton tunnels that give access to the terminal is to be replaced by a twin bore facility. In the last two decades Scotland has seen a number of significant route re-openings and electrification and with infrastructure control now devolved to the Scottish Government their agency Transport Scotland plans further initiatives including electrification to Perth and Dundee. At present a continuation to Aberdeen is not in the plan in part because of the cost of modifying some significant structures such as the Forth Bridge and the potential to use bi-mode express rolling stock. Freight activity in Scotland is greatly reduced as a result of the closure of the coal fired power stations at Cockenzie and Longannet and the focus now is on developing intermodal traffic beyond the central belt. To provide greater competitiveness more structures will be cleared for W10 gauge and the Edinburgh suburban line electrified to provide diversionary routes for trains carrying 9ft 6in high containers on standard height wagons.